The Akron-Canton Regional Foodbank hosted the 11th annual Taste of the Pro Football Hall of Fame on Sept. 25 at the Pro Football Hall of Fame in Canton. More than 600 guests helped provide the equivalent of more than 1 million meals to support individuals and families in our community struggling with hunger, surpassing its goal and raising the most in the event’s history. Hall of Fame Gold Jackets attended the event to mingle with guests and sign autographs. Member of the 2018 induction class, Robert Brazile, was a popular enshrinee with guests and was joined by other incredible legends of the game including Walter Jones, Bruce Matthews and Will Shields. This year’s event showcased delicious cuisine and beverages provided by 24 local and national vendors. Some of the area’s top chefs came together to support the Foodbank and also to compete for the title of Taste of the Pro Football Hall of Fame People’s Choice award winner. After guests walked from table to table sampling each purveyors’ dishes, they cast their vote for their favorite dish. Participants included BOMBA Tacos & Rum, The Canton Brewing Company, Caston & Main Brew Yard, Chocolates by Erin, Cilantro Thai & Sushi Restaurant, Dunkin' Donuts, Gervasi Vineyard, Hoppin’ Frog Brewery, Main Street Gourmet, Meeker Wines distributed by Esber Beverage, Melt Bar & Grilled, Pav's Creamery & HiHo Brewing, Pepsi, The Raging Avocado, The Rail, Robert J. Events & Catering, Saffron Patch in the Valley, SHY Cellars, Streetside/Whiskey Alley, Tozzi's of Magnolia, Troutman Vineyards, The West Side Bakery and The Winery at Wolf Creek. Chosen as the 2018 People’s Choice award winner was SHY Cellars. 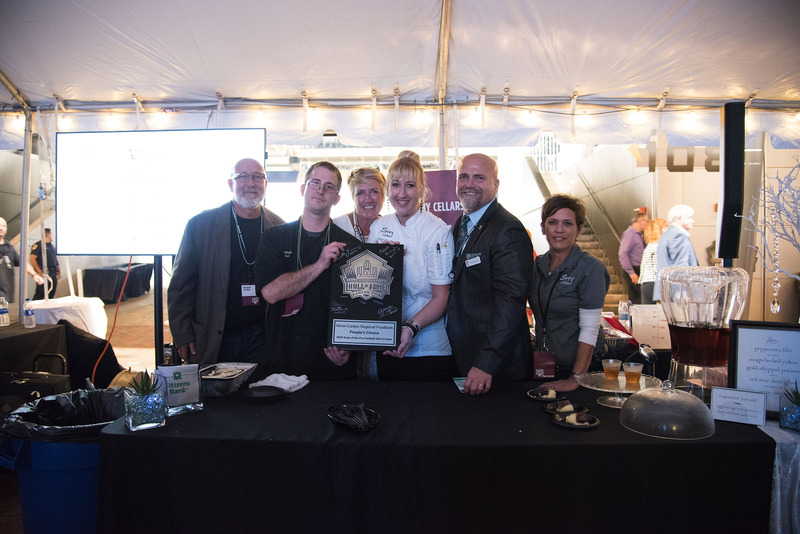 SHY Cellars has earned this title five times and wowed the crowd by serving an asiago-herbed Yukon gold mashed potato with a peppercorn filet, topped with a red wine demi-glace and crispy onions. Meeker Wines, provided by Esber Beverage, was the featured wine provider at the event. Molly Meeker, co-owner of Meeker Vineyards, originally from Youngstown and currently living in California, was present to mingle with guests and offer wine tasting tips. Taste of the Pro Football Hall of Fame is presented by Citizens Bank and Rubber City Radio Group stations including WQMX, WONE, WAKR and WNWV. Taste of the Pro Football Hall of Fame is a partnership between NFL teams and food banks across the country. Local events are held in NFL cities throughout the year, and a national Taste of the NFL event is held the evening before the Super Bowl. The Akron-Canton Regional Foodbank is proud to partner locally with the Pro Football Hall of Fame in lieu of an NFL team. For more information about Taste of the Pro Football Hall of Fame or the Akron-Canton Regional Foodbank, visit akroncantonfoodbank.org or call 330.535.6900.